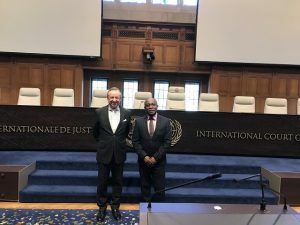 Foreign Affairs Minister Carl Greenidge, who is Guyana’s Agent in the court proceedings, delivered the application to the ICJ Registrar, Philippe Couvreur. Guyana on Thursday applied to the International Court of Justice seeking confirmation that the 1899 Arbitral Award of the boundary with Venezuela is legal, valid and binding. The Ministry of Foreign Affairs indicated that Guyana is banking on the fact that Venezuela had for several decades recognised the award and boundary. “In its application to the Court, Guyana highlighted that Venezuela had, for more than 60 years consistently recognized and respected the validity and binding force of the 1899 Award and the 1905 Map agreed by both sides in furtherance of the Award”. However, Guyana notes that Venezuela changed its mind in 1962 as Britain was preparing to grant independence. “Venezuela had only changed its position formally in 1962 as the United Kingdom was making final preparations for the independence of British Guiana and ad threatened not to recognize the new State, or its boundaries, unless the United Kingdom agreed to set aside the 1899 Award and cede to Venezuela all of the territory west of the Essequibo River, amounting to some two-thirds of Guyana’s territory,” the Foreign Ministry here said. The Foreign Ministry added that Venezuela has never produced any evidence to substantiate its belated repudiation of the 1899 Award, that country has used it as an excuse to occupy territory awarded to Guyana in 1899, to inhibit Guyana’s economic development and to violate Guyana’s sovereignty and sovereign rights. Greenidge filed the application with The Hague-based court almost two months after United Nations Secretary General, Antonio Guterres decided to refer the border controversy to ICJ after the two countries failed in 2017 to reach agreement on resolving the issue under the Good Officer process. Despite concerns in some quarters that Venezuela might argue that the ICJ, also known as the World Court, does not have jurisdiction to resolve the controversy, the Foreign Ministry said the UN Secretary General’s authority is “rooted” in the 1966 Geneva Agreement that was negotiated just before Guyana gained independence from Britain.